These ain't your mama's meatballs! 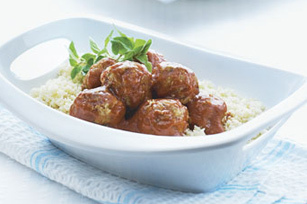 These are made with ground pork, cream cheese and pimento-stuffed green olives and served over hot couscous. Mix first 8 ingredients until well blended; shape into 24 balls, using about 2 Tbsp. for each. Heat oil in large nonstick skillet on medium heat. Add meatballs; cook 5 to 6 min. or until evenly browned, turning occasionally. Add sauce; simmer on medium-low heat 10 to 15 min. or until meatballs are done (160ºF). Save 100 calories and 11g of fat, including 3g of saturated fat, per serving by preparing with extra-lean ground beef. Use small cookie scoop to portion the meat mixture for each meatball.